When a group of small boys, out to play ball, arrived at the play ground, they discovered that no one had brought a ball. "Forget the ball," said one impatiently. "Let's get on with the game." The Pharisees had many good points. Our Lord said, in effect, "Do as they say." They read the Scriptures, prayed, went to God's house, tithed, and lived separated lives. They were anxious to preserve religion in Israel. Winning converts to the religion of Moses had been a good and right thing to do. But their religion had become institutionalized, and now they were propagating a dead faith, and every, new convert was a twofold child of hell, a lost heathen, and a lost proselyte. Generally, we are propagating today a degenerate brand of Christianity. Unless the church repents, and has a complete overhauling instead of a tune-up job, our evangelistic and missionary drives may add for the most part only a multitude of proselytes who are both unsaved pagans and unregenerated church members. Like produces like. There is no greater hindrance to revival than a comfortable pastor settled and satisfied, coasting along until he reaches retirement, who does not want his flock disturbed or the status quo upset. He has long since lost his burden and concern for a mighty upheaval of God among the resters at ease in Zion. He resents any intrusion into the complacency of a sleeping church, and interprets the prophet's call to repentance as an indictment of his own preaching. He is determined not to get excited, assumes a philosophical tolerance of things as they are, and he may speak facetiously of the prophet's seriousness. Sometimes his own people may get under conviction, and put him to shame by a concern he does not seem to feel. This makes it exceedingly difficult for any revivalist calling Christians to repentance, but what a delight when pastor and prophet stand together! Most pastors understand that the traveling prophet can say things the pastor cannot say-that he fills a different role and follows an utterly different pattern. They complement each other. One plants, another waters, but God gives the increase. The teacher plants the seed, the pastor cultivates the crop, the evangelist gathers it, but the prophet must first break up the fallow ground. Breaking up the ground is never a pleasant, comfortable business, and churches sometimes resent the plow of plain preaching. Blessed is the pastor, who knows this, and stands behind the lonely prophet who calls the church to repentance. Hallelujah! What a great fighting word! Loving Father, help me by the power of the Holy Spirit,help me to hunger and thirst after you and your word, and to stand behind your prophets, as they seek to bring the Church into revival. I ask this in the wonderful Name of Jesus. Amen. SUNDAY SERMON ON THE BLOG – DO YOU HAVE FALTERING LIPS? Moses had to be taught the same lesson most of us have to be taught; most people really don't care how we say it, but, they know it is important that we do we say it. If the truth be known, most of us can't say it very well, anyway. But, when we offer ourselves to the Lord, He truly works through us and uses us in powerful ways. Moses is the great testimony, that God can take a shepherd with uncertain speech ,and turn him into the supreme leader of his time. Don't you think, that we had better ask what God wants to do with us, and then get on with achieving it? Loving Father, use me in your service. I recognise that all the gifts, abilities, and experiences that I have, all come from you. All my capabilities are given to me so I can bring glory to you. By the power of the Holy Spirit, enable me to use my abilities for your glory. In the wonderful and mighty name of Jesus I pray. Amen. SUNDAY SERMON ON THE BLOG – GET YOURSELF A TATTOO! “New and Better!” That should be tattooed across the forehead of every Christian! When we come to Christ, He makes us new and He cleanses us of all our sins. Amazinglyly, this grace can be “new every morning,” because of God's faithfulness and transforming power. God's grace and power are given to us through His Holy Spirit. We are new and better, and will continue to be that way until we are completely transformed to be like Jesus! Loving Father, have your way with my heart, my will, my life, and my time. I want to yield myself to you so that you can make me new and better. I don't want to be satisfied with where you have brought me. Help me by the power of the Holy Spirit, to become more like Jesus today, and each day of my life that follows. In the wonderful and mighty name of Jesus I pray. Amen. 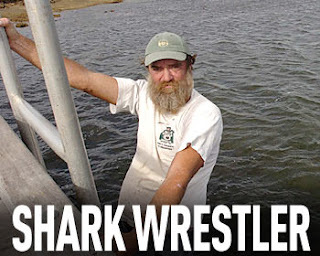 EYRE Peninsula man, Phillip Kerkhof has wrestled a 1.3m shark - and lived to tell the tale with barely a scratch on him. On Monday night, after "quite a few vodkas", the 42-year-old bricklayer from Louth Bay, near Port Lincoln, thought it would be a good idea to jump in the ocean and wrestle with a 1.3m bronze whaler shark that had been spotted "hanging around". He caught the shark with his bare hands, dragging it onto the Louth Bay jetty to the cheers of other fishermen. The only damage was to his jean, which received a few nips. But rather than keep hold of his "trophy shark" as a memento, Mr Kerkhof skinned and gutted it, and has been eating it all week. "I've got 10 or a dozen real good feeds from it, and I've still got a fair bit of him in the freezer to last me a while," he said. Mr Kerkhof admits his actions were not very clever and "wouldn't recommend anyone try it". "It's amazing what vodka does to you, but when I woke up the next morning I thought it probably wasn't the smartest thing to do," he said. SUNDAY SERMON ON THE BLOG – GETTING OUR PRIORITIES RIGHT. We run after after so many materialistic things, but only one important thing is really required. Having a bankbook full of money, a great big house, a fancy flash car, and lots of status, doesn't mean a whole lot if you've gone to your final destination without the Lord. Even worse, is to find that in the middle of your unimportant pursuits, you awake to find yourself in the desolate territory, where Christ does not dwell and life is not found. Let’s get our souls right, and we will get our priorities right! Loving Father, help me by the power of the Holy Spirit to get my priorities right, by keeping my life holy, and my heart obedient to your will, rather than being captivated with my own selfishness. In the wonderful and mighty name of Jesus I pray. Amen. We are at war! We face a daily battle, and it is not just with sin and temptation. We have a real enemy whose desire for us is our annihilation. But, our enemy has already been conquered, and his demons stand rebuked. So, let's keep our spiritual vitality knowing that we're not playing church, but fighting for the Kingdom, for the lost, and for our loved ones. Lord Jesus, my victorious and conquering King, I praise you for conquering sin, death, and the law for us, for making us righteous and sinless, by your grace. Help me by the power of the Holy Spirit, to know that I am on the winning side, and that I can confidently take your gospel, to the lost and to my loved ones. I thank you for this, in your wonderful name I pray. Amen.